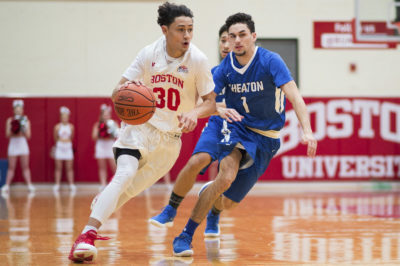 Fresh off the heels after an impressive outing in Annapolis against the United States Naval Academy, the Boston University men’s basketball team will look to continue its hot start to Patriot League play at the Kirby Sport Center when it plays Lafayette College. According to BU (10-9, 6-2 Patriot League) head coach Joe Jones, the Leopards (5-14, 3-5 Patriot League) are much better than their record suggests and will provide a formidable foe for the Terriers come Wednesday night. Lafayette boasts the best defensive rebounding record in the conference with 27.5 per game, while also only allowing opponents 11.8 assists per game and .445 assists per field goal. However, BU is quite strong itself on the defensive end of the court. Jones said after the Navy win that the Terriers have implemented zone defense in approximately 90 percent of conference play so far, and Jones has since seen the hard work of his players pay off. BU remains just one game behind first place Bucknell University, who boasts a 7-1 record in Patriot League play. Someone Jones will be looking to contribute a little more is sophomore forward Max Mahoney. The Basking Ridge, New Jersey native is second on the team with 12.1 points per game, but has found himself in foul trouble far too often and leads the team with 3.5 fouls per game. Earlier in the season, Jones named Mahoney as a key contributor for BU this year, but too many fouls were his main concern for the sophomore. Mahoney’s partner-in-crime senior guard Cedric Hankerson’s status for Wednesday’s game is up in the air following a hamstring injury over the weekend. “He’s day-to-day right now, that’s all we really know… It was an aggravation of a previous injury, so obviously that’s never good,” Jones said. Jones will be looking for Mahoney to pick up the slack against a Lafayette team that focuses on defensive isolation and poses a strong threat to the Terriers in both ends of the floor. On the offensive end of the court, senior forward Matt Klinewski, freshman guard Alex Petrie and freshman guard Justin Jaworski pace the Leopards with double-digit scoring. Klinewski leads the team with 17.9 points per game and six rebounds per game. The forward is also currently shooting 45.5 percent behind the arc and 51.3 percent overall. BU has won four straight against the Leopards, including two wins by a margin of 16.5 points last year, but will have to keep its heads on tight to avoid a defeat against a tough team.